Gajalakshmi Puja Vidhi – Mantra – How To Perform Gajalakshmi Puja at Home? Gajalakshmi puja and vrat is observed for overcoming various kinds of financial difficulties including debt, loan etc., and property related problems. After taking bath in the morning offer prayers to Ganesha mind. Spread a red color cloth on the northeast corner of the house. Make Akshat using kesar and chandan – uncooked rice mixed with saffron and sandalwood powder. Draw eight petal rangoli design (अष्टदल) using the akshat. Keep a kalash atop the Ashtadal. Keep a kuber yantra near the kalash. Keep two elephant made using mud and a picture of Gajalakshmi. Dhoop or agarbatti should be of natural flowers. Offer roli, chandan, pink color flowers, fragrant water, supari, coconut and lotus flower. Naivedya (prasad or bhog) should be a sweet made using wheat. Take a thread dip it in turmeric powder and then make 16 knots on it. Offer this to Gajalakshmi. After chant the Gajalakshmi mantra 108 times. To overcome financial difficulties offer 16 kamal ghatta to Goddess Gajalakshmi and later keep it in the money safe. Offer moti conch to Gajalakshmi and keep it safely in house. This will help in bringing in good luck. To overcome property related problems, offer Guava to Gajalakshmi and later give it small children. Offering rose flower to Gajalakshmi daily will help in keeping away accidents and financial loss due to bad weather etc. Offer yellow color small conch to Gajalakshmi and later make mala out of it and wear it. This will help in solving business related problems. 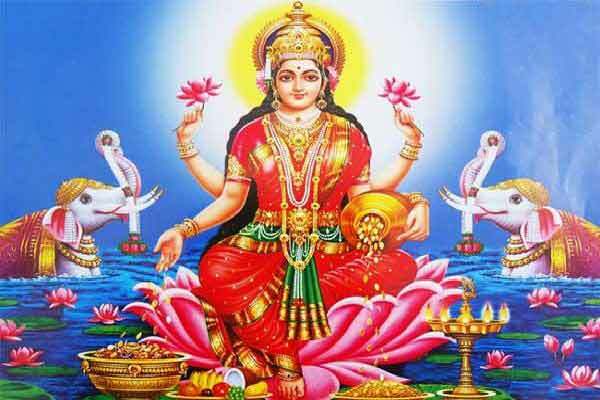 When to perform Gajalakshmi puja?